Summer dinner suiting poses an interesting wealth of possibilities and given that I will be partaking in my final formal dinner as an Oxford undergraduate next week, I’ve been thoroughly enjoying exploring some potential ways to spice up my dinner suit for the occasion. With this in mind, this late 30s fashion plate is rather intriguing. Depicted, as you can see, are a pair of extremely dapper and technically correct yet nonetheless distinctive dinner suits, which present unusual possibilities for distinctive summer dinner suiting. Let us deal with the suit on the right first, as its the more conventional of the two. Here we find a shawl collared, cream dinner jacket, cut with a relatively natural, but broad shoulder, a heavily expressed chest and slim sleeves; a very elegant combination. The jacket is cut as a four by four double-breasted (the top two buttons can be seen, but the bottom two are evidently obscured by the wearer’s stance with broad peaked lapels, faced in cream satin as is conventional. Conventional lightweight black trousers finish the ensemble. Cream dinner jackets for warmer climes seem to have fallen out of favour in recent years, but this illustration attests to the elegance of the look. Not only is cream a practical choice because it remains cooler than dark cloths in the heat, it is a distinguished choice and cream dinner jackets traditionally offer the opportunity to experiment with cloth choices. Linen or linen and mohair blends, tropical weight wools or even raw silks are all options for a cream dinner jacket; featherweight, breathable, luxurious and distinctly different to conventional black Barathea, they offer the opportunity to really stand out from the crowd. So too does the possibility of wearing a double-breasted dinner jacket. Although you might initially think that this is an illogical choice for summer, but if cut in lightweight, breathable cloths then the issue of extra wrap and extra weight should be negated. A double-breasted dinner suit can be the perfect way to make a slightly different statement; the look was first popularised in the late 30s/early 40s providing the opportunity to channel some classical elegance if one so desires and it is just that little bit different to the relatively common and potentially hum-drum single breasted two-piece dinner suit. The suit on the left, takes a more unusual low two by two double-breasted shape, cut in a French navy Barathea or possibly a tonic wool or wool and mohair blend. The lapels are cut with a low gorge, gentle belly and a very broad shape. They make a real statement, helped by the welcome addition of a red carnation. Evidently, the suit is intended to be a statement piece. Although it is common to see dinner suits cut in a very dark navy as opposed to a black, French blue is (in my experience) unheard of. In this respect, this suit could easily be considered incorrect or a dinner dress faux-pas. It is saved however, by a technically correct cut; with satin faced lapels, faced buttons and pocket bindings. I’d suggest that this suit presents a welcome innovation for summer. The colour remains dark, but is more summery in tone and a more practical choice than black, which will absorb more heat than blue. Both gentlemen wear the full-cut, heavily draped trousers of the era, something which can easily be modernised with a slightly slimmer cut or more tapered leg. Note that it is not correct to wear turn-ups with dinner trousers. It is thought that the addition of a turn-up is too business like and spoils the clean line of the trouser for formal evening dress. A single strip of silk is worn down the side seam of the trousers for black tie, a pair of satin strips being reserved for dress trousers worn with a tailcoat. Buttons are faced in satin, as are lapels. A dinner suit traditionally also has the pocket binding and outer side-seams of the trousers faced in satin too. Both dinner suits are cut with horizontal bound hip-pockets, rather than jetted pockets (pockets with flaps). 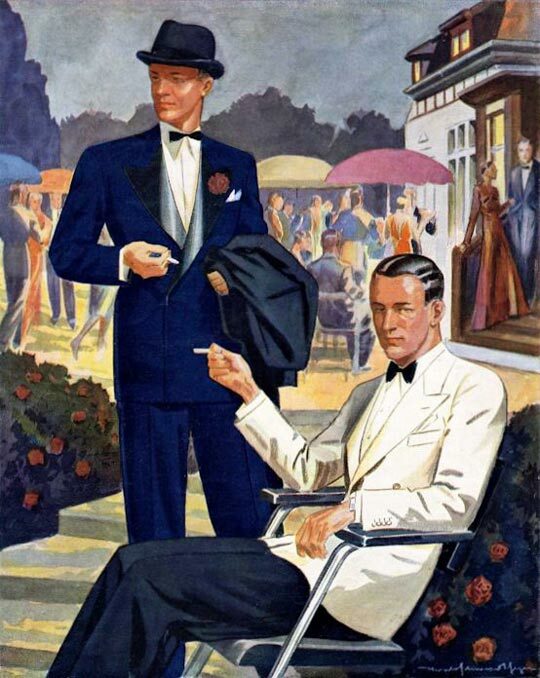 This is technically the correct pocket formation for dinner suits and has its roots in the genesis of the dinner jacket as a form smoking jacket – the lack of flaps allows for the wearer to rest his pipe, tobacco or indeed his hands in the pockets with ease, allowing one to be as relaxed as possible in what was originally a relatively informal garment. Both are wearing a deeply pointed spread collar on their dinner shirts, this being something which I’d recommend. Winged collars are best kept for wearing with evening tailcoats and heavily starched dress shirts. I personally feel that they can look a little antiquated with modern dinner suits and many modern off-the-peg winged collar dinner shirts lack the structure and starch to retain their proper rigid shape. The particularly deep collars on display in this illustration are of course of their era, but nonetheless look rather sharp, and the modern equivalent classic Windsor collar, with no cut-away shape is the best option for dinner dress today. It will close over your tie, and allow it to sit correctly, poking out from the centre of the collar on each side. Cut away collars show too much of the bow-tie as it sits around the neck. It is also worth noting that both these dinner shirts have their plackets covered, for a cleaner appearance. The gentleman on the left is wearing a slim, rectangular batwing bow-tie, whereas the gentleman on the right is wearing the more conventional hourglass shape. There is no right or wrong here, just a couple of different possibilities. The batwing bow tie is certainly more retro and produces a more angular shape which will compliment some silhouettes better than others, so I’d suggest simply experimenting with one if you’re intrigued. Congratulations, Aleksandar. Might I ask what you are studying? I studied Medieval Literature of all things. I’ve always believed in following your heart, and alongside tailoring, medieval history is one of my greatest interests. Does this mean we’ll be getting a piece on the relative merits of doublets, codpieces and curly-toed shoes for your next article? May I point out what appears to be a slight error? “Here we find a shawl collared, cream dinner jacket …” Is it not a peaked lapel coat, rather than shawl? I hope you will share some photos after your dinner next week! Cheers! Many thanks for your compliments – and for your beady eye! You are quite right, I meant peaked lapels! Which colleges still have formals on this late? What will you be wearing then? Congratulations on finishing.